The goal of our Middle School is to develop an independent 21st century learner as we prepare our students for high school by encouraging time management skills, note taking, and ways to apply and refine their writing, critical thinking, and analytic skills across all their academic studies. Technology is infused in all content areas. We ask our Middle Schools students to begin to accept leadership roles in our school community, by organizing community service projects for the needy, serve as mentors to their younger schoolmates, and serve our church at our weekly Mass and other school and parish events. Language Arts- The language arts curriculum ensures students deepen their critical thinking through independent and collaborative experiences. Students build strong grammar and composition skills through descriptive, expository, narrative, and persuasive writing in differentiated reading groupings. Reading comprehension is built through the analysis of poetry, plays, speeches, novels, and nonfiction. Students build their vocabulary through word study and use in specific reading genres and writing. Math- Differentiated groups to promote areas of strength and support individual needs. Historically our students have done very well on the High School Placement test due to their strong foundation and understanding of math. Religion- In addition to studying morality and Catholic Church history, students attend weekly Mass and plan liturgies during the year. Science- The Lab Learner curriculum emphasizes continuous spiral review of learning through hands-on experiments. Students participate in many different activities that will serve as a vehicle for not only scientific concepts but also language skills, math skills, and valuable cognitive skills. Social Studies- Students explore topics via text, class discussions, research, and multi-media projects. Sixth grade students learn about ancient civilizations as well as the Crusades and the Renaissance. Seventh grade students studies world geography. Eighth grade students explore American History. Special Areas- All students attend Spanish, Physical Education, Library, Computer, Art and Music class each week. Clubs and Organizations- A variety of clubs and organizations are available for students to join in both the Elementary and Middle Schools. These include Student Activities Committee, National Junior Honor Society, Peer Mediators, Lego Club, Robotics Team, Cross Country Team, Track & Field Team, and many more! Students in grades 6th–8th learn in a departmentalized setting taught by teachers who specialize in particular subject areas. A cross-curricula team approach is used in our middle school program. Students learn time management skills, note-taking skills, gain self-confidence and ultimately are prepared in every way for quality high schools. In middle school, students move to separate classes for instruction by subject specialists. Middle school students continue to pursue accelerated curricula in math, science (laboratory courses), and English. Technology integration is achieved through project-based learning. In language arts, students learn to apply and refine writing, critical thinking and analytic skills across academic studies. Found below is a listing of the areas of study for each grade level with example content and essential skills. Released in 2011, “Bringing Good News” is the Archdiocese of Baltimore Religion Curriculum for Elementary Schools. This standards-based curriculum serves as a guide, a road map for both teachers and students as they embark on a journey, which will provide them with the knowledge and understanding of the faith as witnessed in the teachings and the traditions of the Catholic Church. The curriculum is built on the Six Tasks of Catechesis: Promoting Knowledge of the Faith; Liturgical Education; Moral Formation; Teaching to Pray; Education for Community Life; and Missionary Initiation and is aligned with the Assessment of Catholic Religious Education (IFG:ACRE). Explain that at the end of time, Christ will return and we will be held accountable for how we responded to the gift of faith and helped to build the Kingdom of God. Trace the unfolding of God’s revelation through the history of the Chosen People &dash; the Jews. Describe each of the seven sacraments as entrusted to the Church. Indicate how the Decalogue relates to current moral issues and leads to greater understanding of the Gospel through the Great Commandment. Discuss evangelization as central to the mission of the Church in which we all have a role. Recognize that the Bible has both divine and human authorship initiated by God to reveal the truths God intends. Investigate the fruits of the Sacrament of Baptism to include forgiveness of all sins, birth into a new life, and a share in Christ’s three&dash;fold mission as priest, prophet, and king. Explain how a well&dash;formed conscience is developed through the knowledge of Scripture and Church doctrine as well as the witness of Church leaders and faithful role models, past and present. Explain the importance of Christians taking an active part in public life and promoting the common good. Discuss the call to religious life in the Church which is identified in two forms: active and contemplative. Understand that Jesus’ paschal mystery, that is his life, passion, death, resurrection and ascension, are central to Jesus’ mission on earth and the fulfillment of revelation. Explain that the context of moral decision&dash;making within the Catholic Christian tradition reflects the values of human dignity, God’s grace, the virtues, the Holy Spirit, and the teaching of the church. Understand that our beliefs are sound and rooted in Apostolic Tradition and Sacred Scripture, as entrusted to the teaching office (Magisterium) of the Church. Describe the progress and continuation of the Church’s mission through ecumenical councils, including, but not limited to: the Councils of Nicaea and Chalcedon, Vatican I, Vatican II, Fourth Lateran, Trent, Constantinople, and Ephesus. Communicate that our respect of other Christians means that we can both recognize what we share in common but that we also need to be honest about how we differ. Catholic educators never forget that our schools exist to bring our students to Christ. By continuing to implement new standards that are challenging, we work to fulfill the promise of quality Catholic education that educates the whole child, both mind and soul. Represent and analyze quantitative relationships between dependent and independent variables. Analyze proportional relationships and use them to solve real-world and mathematical problems. Use properties of operations to generate equivalent expressions. Solve real-life and mathematical problems using numerical and algebraic expressions and equations. Draw, construct and describe geometrical figures and describe the relationships between them. Use random sampling to draw inferences about a population. Know that there are numbers that are not rational, and approximate them by rational numbers. Work with radicals and integer exponents. Understand the connections between proportional relationships, lines, and linear equations. Define, evaluate, and compare functions. Understand congruence and similarity using physical models, transparencies, or geometry software. Understand and apply the Pythagorean Theorem. 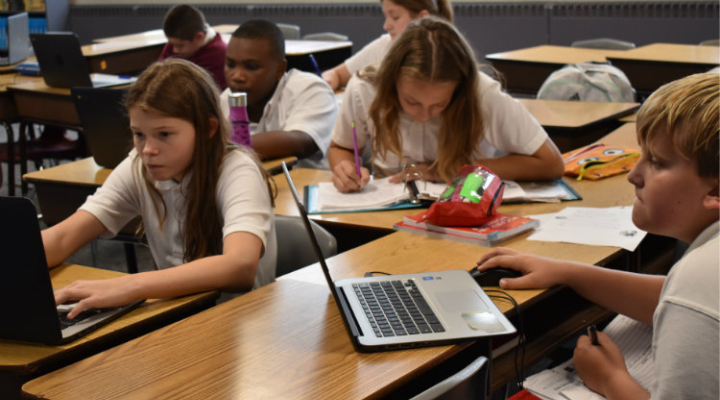 Revised in 2014, the English Language Arts Curriculum for the Archdiocese of Baltimore is designed using the Catholic, College and Career Ready clusters as its foundation. Through literature, this course of study fosters students' Catholic identity, shaping them to be models of Christian living for others. This curriculum is fully integrated with our Catholic faith. 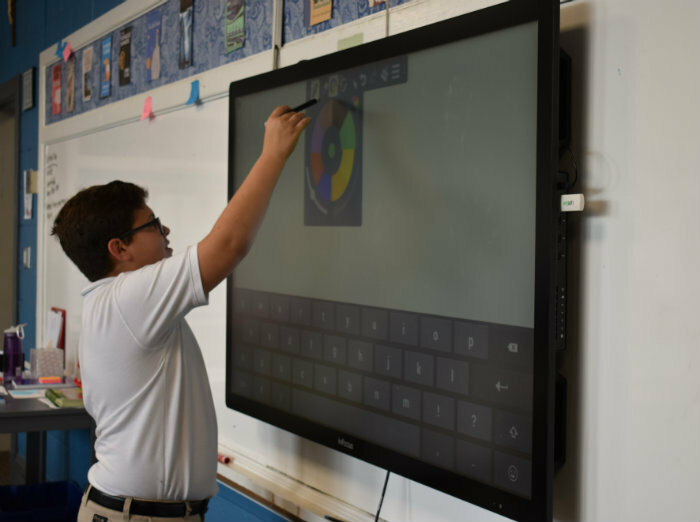 We provide students with a curriculum that is rigorous and rich in literature, oral and written language, grammar, writing, vocabulary, informational literature, and multimedia/technology. Use of the process in research writing. Use of the process in essay writing. Voice and tone in writing emphasized. More Focus in Fiction, Genre, and Literary Elements. Collaboration, oral presentations, speeches, and technology components incorporated regularly. Students will be able to write routinely over extended time frames (time for research, reflection, and revision) and shorter time frames (a single sitting or a day or two) for a range of discipline-specific tasks, purposes, and audiences. Students will analyze the main ideas and supporting details presented in diverse media and formats and explain how the ideas clarify a topic, text, or issue under study. Students should demonstrate understanding of figurative language, word relationships, and nuances in word meanings. Students should acquire and use accurately grade-appropriate general academic and domain-specific words and phrases; gather vocabulary knowledge when considering a word or phrase important to comprehension or expression. Students use their knowledge of word origins and word relationships, as well as historical and literary context clues, to determine the meaning of specialized vocabulary and to comprehend the written word. Students read a good representation of narrative and expository text (e.g., classic and contemporary literature, magazines, newspapers, online information). Students write clear, coherent, and focused essays. The writing exhibits students’ awareness of audience and purpose. Essays contain formal introductions, supporting evidence, and conclusions. Students progress through the stages of the writing process as needed. Students write and speak with a command of Standard English writing mechanics including correct grammar and usage that is appropriate to this grade level. The following subject areas are currently under revision across the Archdiocese of Baltimore, and if you would like more information regarding these standards and essential skills please contact the school directly.